On the Modern Library List of top 100 novels from the 2oth century, it can perhaps be difficult to understand it's significance without understanding the literary landscape in which it was published. 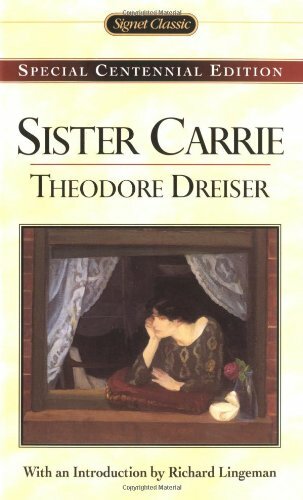 Reading Sister Carrie today, some 108 years after it was published, the plot seems exciting, if not a bit laggard. There would be little indication in today's environment of how much difficulty Dreiser had in finding a publisher. In fact, his reworked edition was the only version to be found up until 1981, when the unaltered version was finally published. What may you ask was so scandalous? It is not the words themselves, but rather the tone that the book set that was so unnerving to turn of the century philosophy. Carrie Meeber moves from rural Wisconsin to big city Chicago where she becomes the mistress of a traveling salesman before eloping to New York City with a married man, where she eventually becomes a famous actress. In so doing, the rags to riches story is contrasted with her husband - George Hurstwood's own fall from grace. Ultimately, the reader is left to ponder if the characters' behavior's should be seen as right or wrong. Dreiser has captured the essence of turn of the century capitalist America. The plot line is fairly well paced and certainly well thought out to keep even modern readers entertained, albeit through almost 700 pages. For the very fact that it was a banned book for it's depiction of adultery, and despite its dilatory plot line, I give it a thumbs up. (this is a new feature that I'll try out in these reviews....we'll see how long it lasts). Sitting alone, she was now an illustration of the devious ways by which one who feels, rather than reasons, may be lead in the pursuit of beauty.